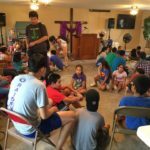 There are hundreds of communities along the Texas/Mexico border that have few churches and little to no gospel witness. The people living in these “colonias” are very poor and have great needs both physically and spiritually. NEXT is partnering with the Valley Baptist Missions Education Center to help plant and establish churches that are committed to reach the people in these communities. Through evangelism, VBS, sports camps, construction and other ministry projects, lives are being changed!